Western blot analysis of extracts from mouse brain, NIH/3T3 cells, rat brain, and C6 cells using GFAP (D1F4Q) XP® Rabbit mAb (upper) or β-Actin (D6A8) Rabbit mAb #8457 (lower). 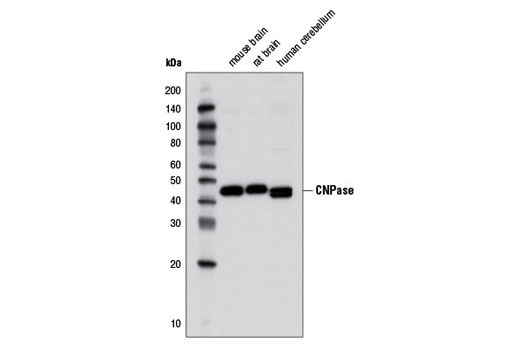 Western blot analysis of extracts from various brain tissues using CNPase (D83E10) XP® Rabbit mAb. 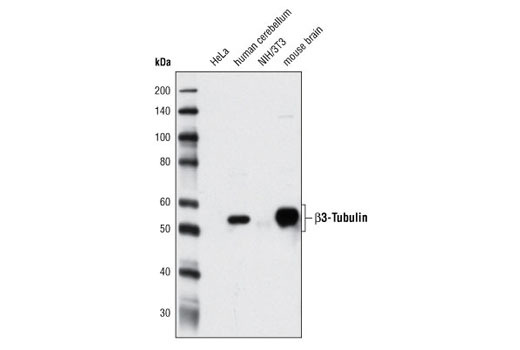 Western blot analysis of HeLa and human cerebellum using β3-Tubulin (D71G9) XP® Rabbit mAb. 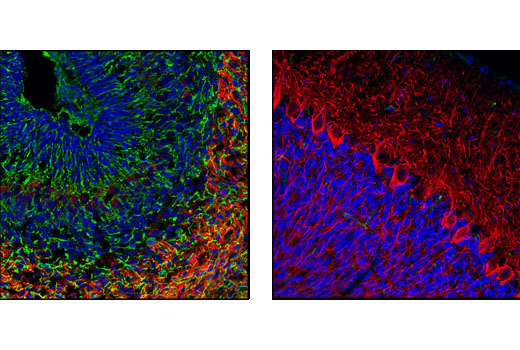 Immunohistochemical analysis of paraffin-embedded rat brain, P1 (left) or P14 (right), using Nestin (Rat-401) Mouse mAb (top) or Neurofilament-L (C28E10) Rabbit mAb #2837 (lower). 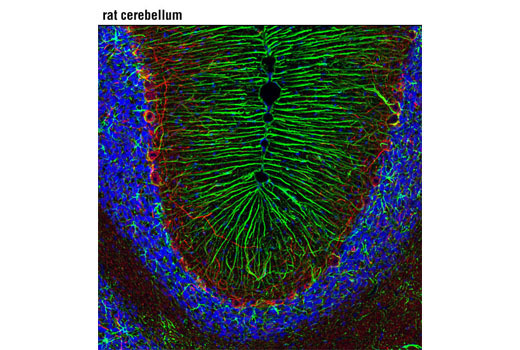 Note decreased Nestin staining as NFL staining increases in the developing rat brain. 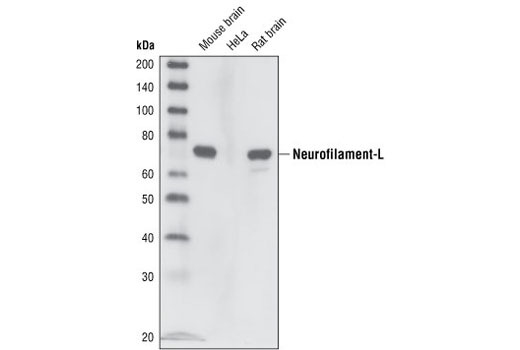 Western blot analysis of extracts from mouse brain, HeLa cells and rat brain, using Neurofilament-L (C28E10) Rabbit mAb. Confocal immunofluorescent analysis of rat cerebellum using GFAP (D1F4Q) XP® Rabbit mAb (green) and Neurofilament-H (RMdO 20) Mouse mAb #2836 (red). Blue pseudocolor = DRAQ5® #4084 (fluorescent DNA dye). 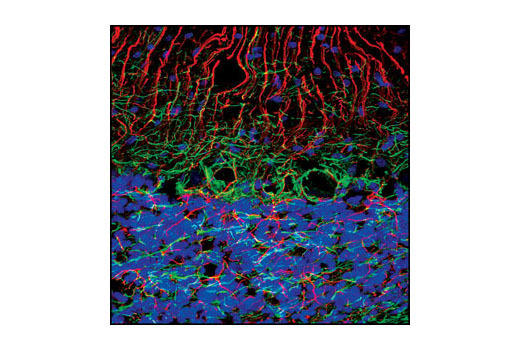 Confocal immunofluorescent analysis of rat cerebellum using CNPase (D83E10) XP® Rabbit mAb (green) and α/β-Synuclein (Syn205) Mouse mAb #2644 (red). Blue pseudocolor = DRAQ5® #4084 (fluorescent DNA dye). Confocal immunofluorescent analysis of P19 cells that were differentiated with retinoic acid, using β3-Tubulin (D71G9) XP® Rabbit mAb (green). Actin filaments were labeled with DY-554 phalloidin (red). Blue pseudocolor = DRAQ5 #4084® (fluorescent DNA dye). 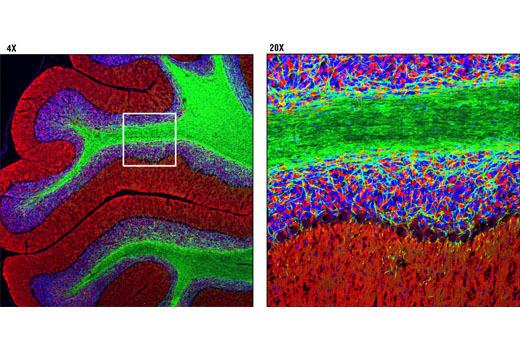 Confocal immunofluorescent analysis of P1 rat brain (left) and adult rat brain (right) using Nestin (Rat-401) Mouse mAb (green) and Neurofilament-L (C28E10) Rabbit mAb #2837 (red). Blue pseudocolor = DRAQ5® #4084 (fluorescent DNA dye). 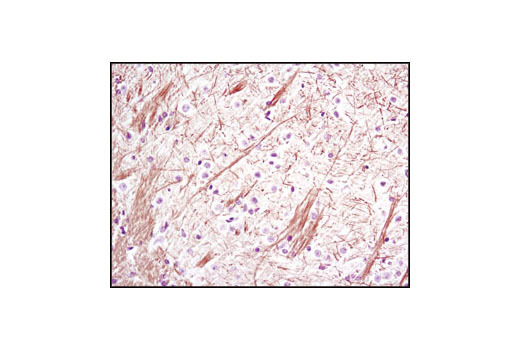 Immunohistochemical analysis of paraffin-embedded mouse brain using Neurofilament-L (C28E10) Rabbit mAb. Confocal immunofluorescent analysis of mouse cerebellum using β3-Tubulin (D71G9) XP® Rabbit mAb (green) and Tau (Tau46) Mouse mAb #4019 (red). Blue pseudocolor = DRAQ5® #4084 (fluorescent DNA dye). 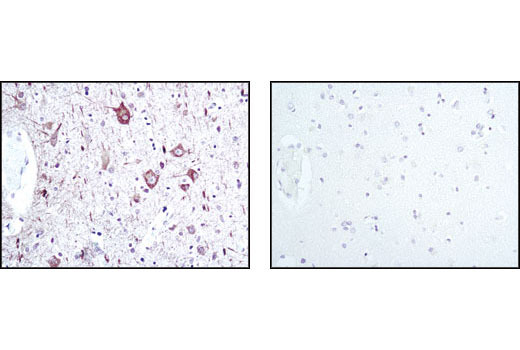 Immunohistochemical analysis of paraffin-embedded human brain using Neurofilament-L (C28E10) Rabbit mAb in the presence of control peptide (left) or Neurofilament-L blocking peptide #1005 (right). 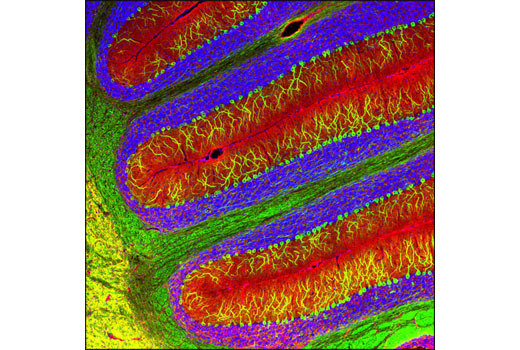 Confocal immunofluorescent analysis of normal rat cerebellum using Neurofilament-L (C28E10) Rabbit mAb (green) and GFAP (GA5) Mouse mAb #3670 (red). Blue pseudocolor = DRAQ5® #4084 (fluorescent DNA dye). Each antibody in the Neuronal Marker IF Antibody Sampler Kit has been validated for IF-F, recognizes only its specific target, and does not cross-react with other family members. CNPase (D83E10) XP® Rabbit mAb recognizes endogenous levels of total CNPase protein. 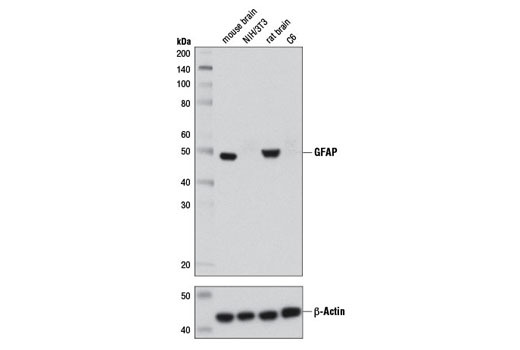 GFAP (D1F4Q) XP® Rabbit mAb detects endogenous levels of total GFAP protein. Nestin (Rat-401) Mouse mAb detects endogenous levels of nestin protein. 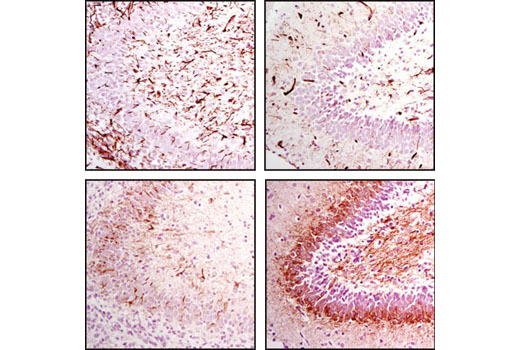 Neurofilament-L (C28E10) Rabbit mAb detects endogenous levels of total Neurofilament-L protein. β3-Tubulin (D71G9) XP® Rabbit mAb detects endogenous levels of total β3-tubulin protein. This antibody does not cross-react with tubulin isoforms expressed in non-neuronal cells. This clone is similar to TUJ1. Expression of these proteins may vary in different cells and tissues. Rabbit monoclonal antibodies are produced by immunizing animals with a synthetic peptide corresponding to residues surrounding Asp395 of human GFAP protein, or the carboxy terminus of human β3-tubulin protein, or residues surrounding Val81 of human CNPase protein, or Glu450 of human Neurofilament-L protein. The antibodies in this kit serve as neuronal markers to determine protein localization in neurons. The cytoskeleton consists of three types of cytosolic fibers: microfilaments (actin filaments), intermediate filaments, and microtubules. Neurofilaments are the major intermediate filaments found in neurons and consist of light (NFL), medium (NFM), and heavy (NFH) subunits (1). Nestin is an intermediate filament family member protein that is structurally related to the neurofilament proteins (2). Globular tubulin subunits comprise the microtubule building block, with α/β-tubulin heterodimers forming the tubulin subunit common to all eukaryotic cells (3). High CNPase expression is seen in oligodendrocytes and Schwann cells as CNPase accounts for roughly 4% of the total myelin protein in the central nervous system (4). CNPase binds to tubulin heterodimers and plays a role in tubulin polymerization and oligodendrocyte process outgrowth (5). 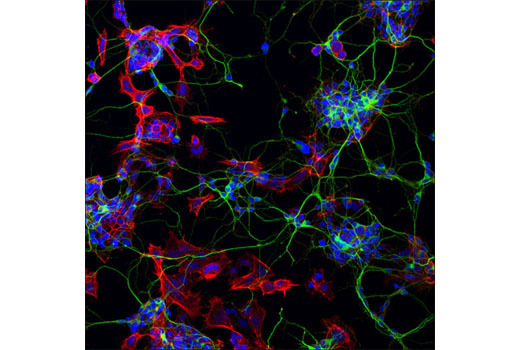 GFAP filaments are characteristic of differentiated and mature brain astrocytes. Thus, GFAP is commonly used by investigators as a marker for intracranial and intraspinal tumors arising from astrocytes (6). Michalczyk, K. and Ziman, M. (2005) Histol Histopathol 20, 665-71. Kozlov, G. et al. (2003) J Biol Chem 278, 46021-8. Lee, J. et al. (2005) J Cell Biol 170, 661-73. Al-Chalabi, A. and Miller, C.C. (2003) Bioessays 25, 346-55.